BBC VIDEO presents a groundbreaking live-action original family movie, bringing viewers into the heart and mind of the majestic lion. A real pride of lions, filmed on the plains of Africa, become the characters in a magical and dramatic tale of love and survival in PRIDE, an ambitious new family film. Kate Winslet heads the cast of celebrated international talent as the voice of the young, rebellious Suki, with Sean Bean as Dark, her dangerous yet magnetic suitor, and Helen Mirren as Suki's mother Macheeba, the wise matriarch of the pride. Other celebrity voices include Jim Broadbent and Rupert Graves. Amazing character effects and animation were created by the world-renowned Jim Henson's Creature Shop. The DVD debut September 7, 2004 following its national television premiere in June 2004 on A&E. The director, John Downer, is one of the world's most prominent natural history film makers. "This genre is a completely new thing for television, in the manner of Babe, using real animals and animation techniques," says John Downer. "The main story focuses on a pride of lions, fantastic unique animals, who live in human type set-ups. They defend each other and form allegiances. It's more biologically accurate than The Lion King, and the starting point is natural history." Jane Tranter, BBC Controller of Drama Commissioning, says: "PRIDE, like The Canterbury Tales, is part of a growing slate of original, ambitious pieces for BBC ONE that work alongside our new and established popular dramas. It fuses the BBC's core strengths with our desire to extend drama into new areas. With the aid of computer manipulated images as well as some habituated lions, PRIDE depicts the almost human traits of real lions in a close community. Family, love and loyalty are tested in a conflict with another pride of marauding wanderers over ultimate control of the Pride lands. Simon Nye, best known for penning sharp comedies but also responsible for bringing the cherished childrens series The Railway Children and Pollyanna to television, understands the need for engaging family programmes: "I've got four children so I wanted to write something we could all sit down and enjoy together. PRIDE is a rip-roaring tale, a fusion of comedy, drama and natural history." PRIDE is a BBC and A&E Networks co-production, in association with ProSieben and John Downer Productions. PRIDE is a stunning, if not altogether satisfying, achievement. What's extraordinary about the live-action drama is its seamless pairing of vivid documentary footage capturing real lions on the lush African savannah with computer-generated animation that allows the lions to speak and take on human characteristics. 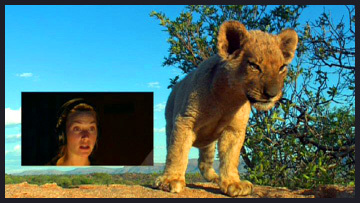 The tale centers on two sibling lion cubs, Suki voiced energetically by Kate Winslet and Linus a playful Rupert Graves. The young lions long to explore their uncharted world, especially the curious Suki. In particular, she is fascinated by what lies beyond a nearby river that serves not only as her pride's primary water source but also as an important defense against predators. Her elders are concerned about "wanderers," rogue lions that attack prides and attempt to take them over. Early in the story two wanderers, Dark Sean Bean and Harry John Hurt, attack and kill one lioness before Suki and Linus's fiercely protective mother, Macheeba Helen Mirren, drives them off. As Suki grows, so does her rebellious streak, which leads to tension between her and Macheeba. Part of the problem is that Suki refuses to hunt. She doesn't believe in killing. She also wants to make pets out of other animals. But the biggest problem occurs when Suki, in one of her journeys across the forbidden, crocodile-infested river, meets the brash Dark. She falls for him and considers him to be her boyfriend. When Macheeba learns of the relationship she is outraged. Their falling out prompts Suki to join Dark and his fellow wanderers, which only adds to the tension between the two camps. The lions are filmed with a "boulder-cam," a remote-controlled camera and microphone that are housed inside a fiberglass container camouflaged to look like a boulder. The container is mounted on wheels so it can move among the lions freely and capture their movements up close. As a result, viewers are treated to a unique look at life inside a real pride. The first-rate voice talent of Kate Winslet gives life and distinct personality to Suki. Parents will appreciate the strong family values put forth by the film. At one point Macheeba explains the value of the pride to her cubs. "We're like the stars," she says. "On our own we sparkle, but together we really shine. We're like a perfect constellation, so much the better for being together." Unity and teamwork are paramount in the PRIDE.